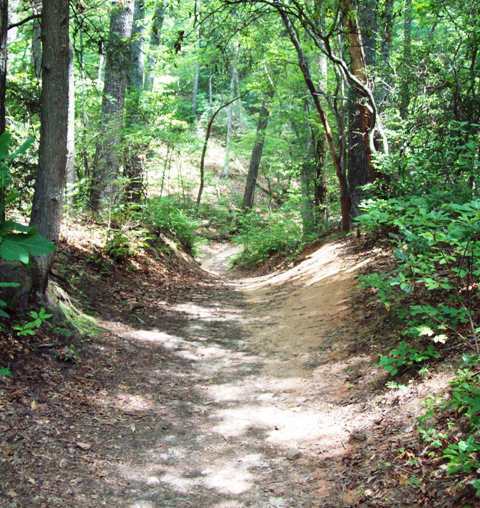 Bent Creek is Asheville’s mecca for mountain bikers. 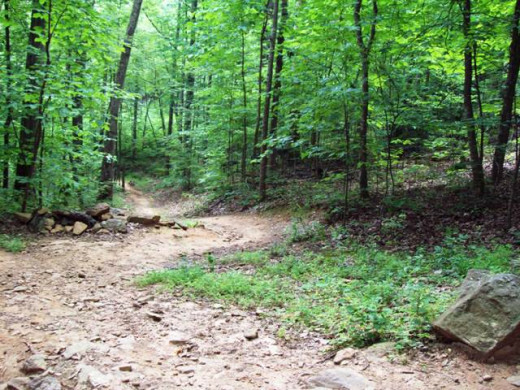 It offers miles and miles of trails and it’s only 15 minutes from downtown Asheville. 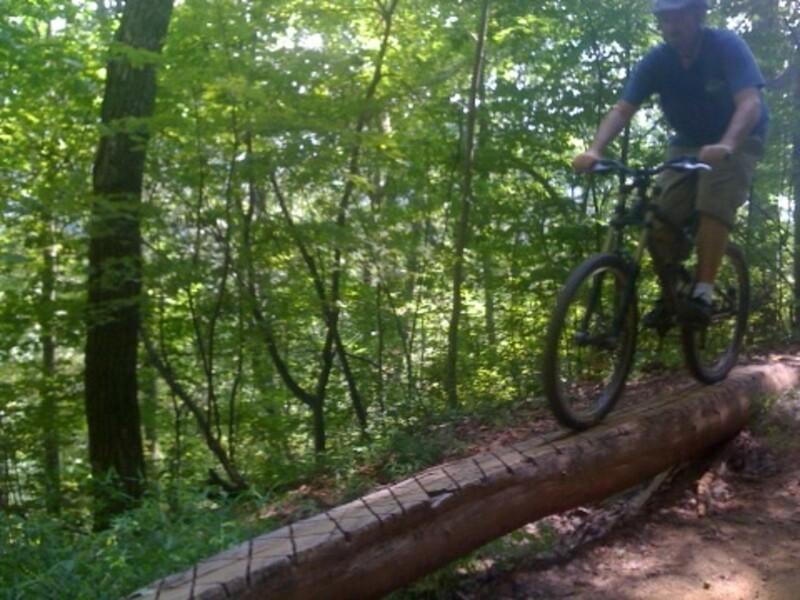 Mountain biking is one of the best ways to explore the forest near Asheville. 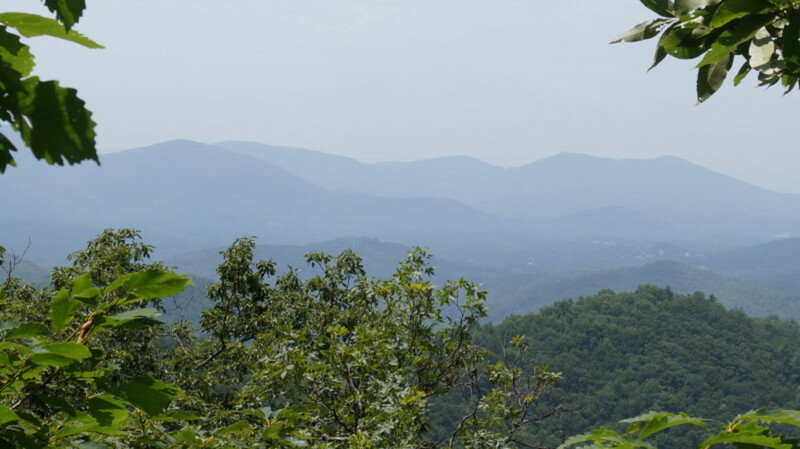 Many people move here because of the proximity to the mountains and outdoor activities abound. Bent Creek offers things to do for the whole family. 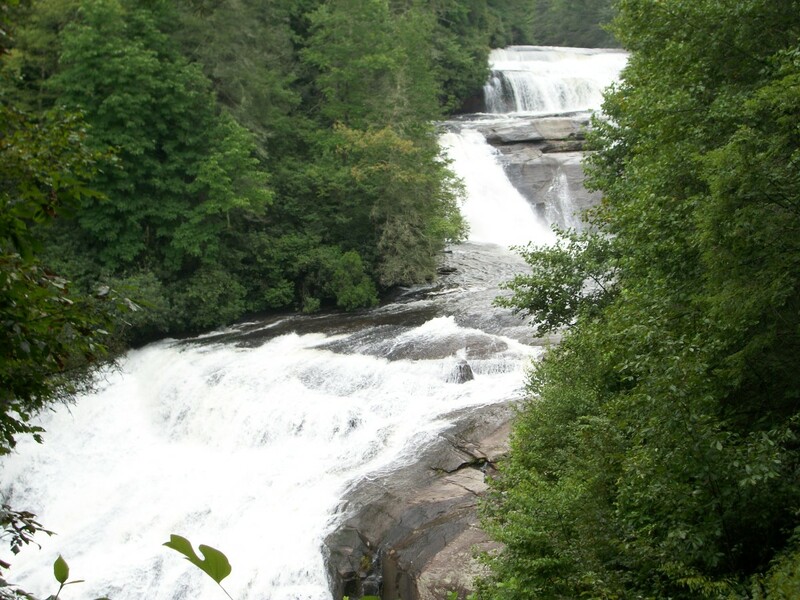 It’s a great place to swim, have a picnic, take a hike, go fishing, and have a great mountain bike ride. The Lower Sidehill ride is a fun loop that starts out with a not-so-fun climb. It’s not that bad, though because you’re mostly going up a gravel road. When you do get onto the trail, the climb is a bit brutal for only .2 mile, and then after that it levels out. The reward is a long single-track down hill interrupted only by some streams, a few interesting turns and some rocks in the trail. It’s a fast, gnarly down hill, but when you exit onto road 479G, you’re only finished with the upper part of Lower Sidehill. The trail continues a little ways down the road for more screaming fun. By the end of the ride, you’ll have a hankering to jump in the lake. There are plenty of little watering holes around, too, if you’re so inclined. Lower Sidehill isn’t that crowded. Even when Bent Creek is busy with people, I might see two or three other people on this trail at most. It’s not a beginner’s trail, but if you’ve been out riding a few times, you shouldn’t have too many problems navigating it. Getting There: From Asheville, take I-26 to 191 (Brevard Road), south. About two miles down the road, turn right onto Bent Creek Ranch Road. Bear left at the fork (where the condos are); this is Wesley Branch Road. 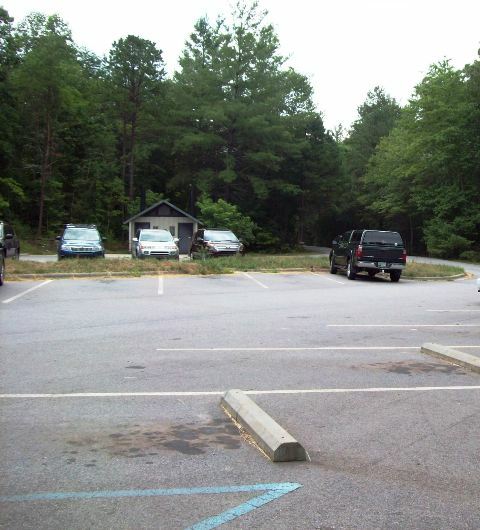 Go about another mile and a half to the Rice Pinnacle trailhead/parking lot on the right. Mile 0.0 – Start out at the Rice Pinnacle Parking Lot and take the Deer Lake Lodge Trail. Cross the bridge. 0.15 – Bear left at intersection and head toward the Hardtimes Connector Trail. You’ll get your first taste of rooty goodness as you climb just a teensy bit. 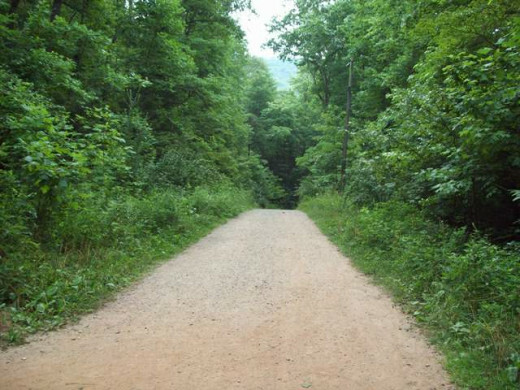 0.24 – Cross the Wesley Branch Road; you’re now on the Hardtimes Connector Trail. There is some uphill here for awhile, but then again, it’s a good warm-up. It levels out nicely and then the twisting turns spit you out at the end of the trail in no time. 0.9 – Turn left onto Hardtimes Road (this is just down from the Hardtimes Trailhead). Watch out for small running children and dogs running amok. 1.1 – Bear right onto Bent Creek Road (480B). This time, you’ll watch out for furtive teenagers holding hands. 1.3 – Lake Powatan is on your left and you’re on the paved road (still Bent Creek Road). Don’t get caught by someone’s fishing line. 1.6 – Intersect with road 481, but go straight through. Watch out for the oblivious passing car. 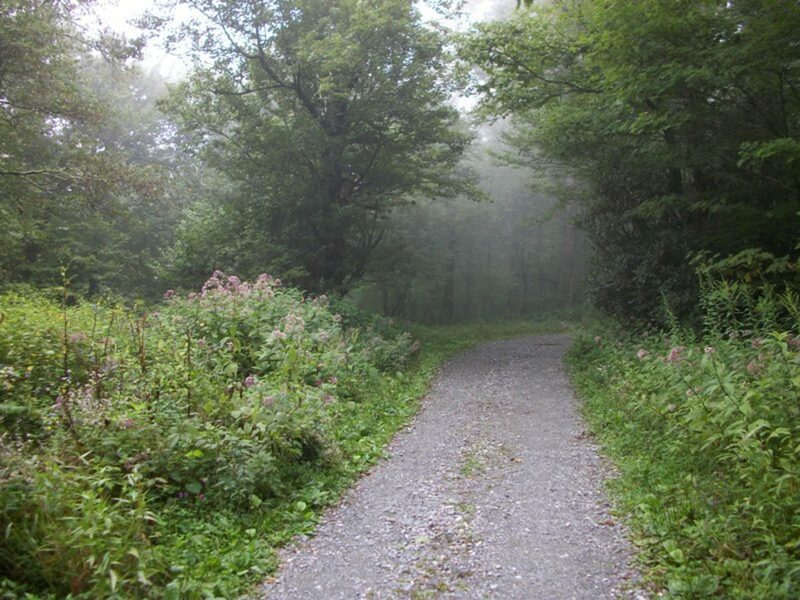 1.7 – Pass campground on your right and head onto Connector Trail. I’m not sure if there’s another name for this, but that’s what the oh-so-original sign said. 2.1 – Intersect with road 479 and go left. Begin long, steady climb on dirt road. You know you’re starting to slow down when the butterflies start flying faster than you are. 2.7 – Pass road 479G on right. The road starts to steepen after this. Still, think of the butterflies. 3.9 – Intersect with Lower Sidehill trail. You’ll begin a sharp ascent; make sure you’re in a lower gear! I say this as if I’m not in a pretty low gear already when I intersect with this trail. This is the point where my legs feel like they’re on fire already. Take a minute before starting the brutal climb. I’ve run into trees right here before (not that hard) from falling over from exhaustion. Still, though, it’s not that bad! 4.1 – Lower Sidehill levels out. It stays fairly level for awhile. Thank goodness. I thought I’d need a lung transplant. This is a great resting spot, too. Lots of people make it a goal to stop right here because it’s the turning point for the ride – a feeling of flying awaits you. 4.9 – The downhill is really screaming now. Rocks and roots jut out, not to mention sinuous turns that come out of nowhere. This part of the trail tests your biking skills, but it’s so fun to come out on the other side having “defeated” it. 5.4 – Go left at intersection and get ready to cross a refreshing stream. 5.6 – Turn right onto 479G. Head down, but not all the way to the end! It’s way too easy to get going over 20 mph through here and miss your turn! 5.7 – Turn left onto the lower part of Lower Sidehill. 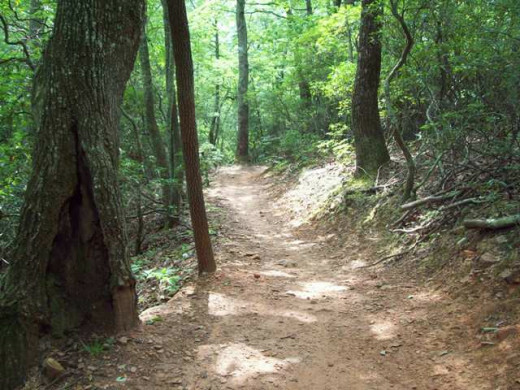 It’s a slightly rocky double-track in the beginning of the trail, then merges into single-track. There is some incredible single-track downhill here, with bridge crossings, rocky outcroppings, and more roots jutting out. Whoopee! 6.3 – Turn right onto 479F (Boyd Branch Road) as Lower Sidehill ends. I’m really sad that the downhill has ended. I contemplate going back up. Nah. Head back toward the lake. 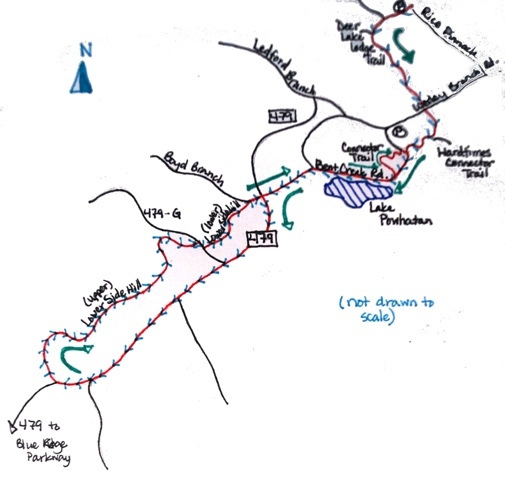 6.9 – Intersect with 479 and go straight – all the way back toward Lake Powhatan. 7.3 – There’s an unmarked connector trail on your left. Take it! It’s right at the top of the little dam on the east side of Lake Powhatan. Gear down, but not all the way down – your back wheel will slip if you do. 7.4 – Watch the large hole to your right! Seriously! I would not want to fall down that thing! 7.6 – Cross the large stream; enjoy the cool-down. 7.63 – You’ll be back on Hardtimes Road. Go right. You might want to watch out for all the families that like strolling on this road. 7.7 – Take the 2nd trail on your left. You’re back on the Hardtimes Connector Trail. Gear down, too, because this turns into a short, steep uphill. It levels out soon enough, though, for some tabletop fun! Tabletops are wavy turns that deviate slightly from the main trail but make you feel like you’re swooshing. 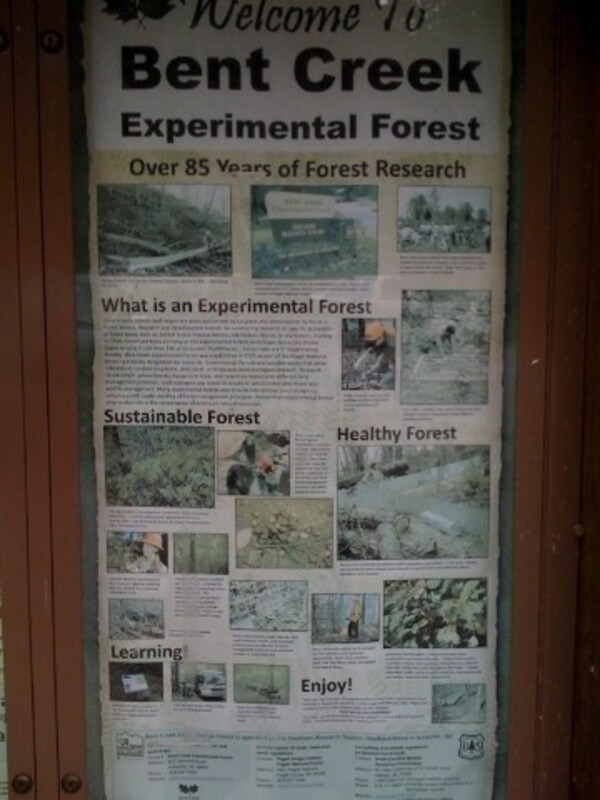 8.6 – Cross the road and head back toward Deer Lake Lodge Trail. 8.7 – Turn right at the intersection. 8.89 – End at parking lot. Is it over? Sadness. With all the different options and functionalities out there, it’s really up to you on which brand you like. I’ve tried a few different variations but for me, I’m sold on the Fox Launch Pro Knee Guards (not the ones with the shin guards). They’re comfortable on your knees, very flexible for pedaling and very secure when riding rough terrain. The worst is when you ride through a rough patch and your pads fall down your legs, these have not done that to me! TToombs - thanks so much! I had fun "filming" the video hehehe. Hubhugs! Wow, Cyndi, this is awesome and I love the video. It really give your hub a lot of depth. Great job! VUMS! Teaches - hehe, that's me. Yep, I do like a fun mountain bike ride. :D Oh...and you reminded me. I have to go back and add my hand-drawn map. Thanks!! Hubhugs and I hope you have a wonderful day!! Was that you in the video? Awesome! I am living through your adventure and enjoying it. Great way to add to the topic. Love the way you had given directions to the journey. Great hub with lots of useful information! My husband is big-time into mountain biking - I'll be sure to have him check this out the next time he heads to NC. Voting up! Great video -- is that you on the bike? Looks like a lovely trail but a little far for me to get to in Southern California. Voting this Up and Beautiful. brenda - you know, I didn't know there were mountain biking trails in Oklahoma. Hmm..I lived in Colorado growing up, but I didn't know that! Cool! You learn something new every day. :D I used to take epic falls...usually these days it's the parking lot that I have to watch out for - I was pumping my tires before this bike ride, actually, and when I pulled the air tube from my bike, I hit the cassette with my thumb...spurts of blood all over. Sheesh. :) Thanks for stopping by. This makes me miss mountain biking. 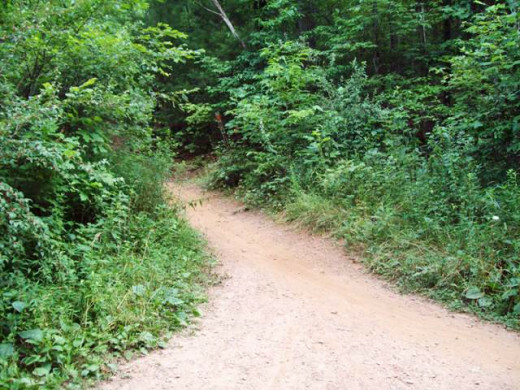 When I loved in Oklahoma they were some really great trails. In West Texas, the trails are dotted with cactus. Not appealing for someone known to take epic falls off her bike. Great hub and pictures! OD - hehe, yeah, I decided to add some...er...commentary to my trail description. Haha. Unfortunately, I don't have a helmet cam. If only. Nah, I took some of the shots myself and John helped with most of the others. After this video, though, instead of using my camera, I'm considering one of those flipcams. Alas...one day. :) Thanks for comin' by!! Josh - haha. The trails at Bent Creek are pretty fun. I'm glad you liked how I did this. Perhaps one day you'll be able to try it out. :D Yes, road trips are awesome! :) Take care. Cheers! Great video and trail descriptions of what looks to be a fantastic place to go mountain biking. I assume that the videography was done with a helmet mounted camera. "Watch out for furtive teenagers holding hands" HA!! Thanks again Cyndi and have a great rest of your night! What a great video! That really added to the hub! I think you and I have started something with these personal videos...they are catching on and I love them. Great job Cyndi and beautiful countryside.